LOS ANGELES — When Juana Monroy moved into Hollenbeck Terrace in 2015, she learned that the towering senior apartment building was once a busy hospital that had appeared in dozens of movies and television shows. Then she heard the rumors that the old Linda Vista Community Hospital building was haunted. "I was a little scared," said Monroy, 60. But she hasn't seen a ghost yet, and now she loves living in a building with such history. Across the country, hospitals that have shut their doors are coming back to life in various ways, from affordable senior housing, to luxurious multimillion-dollar condominiums, to historic hotels and more. In the Capitol Hill neighborhood of Washington, D.C., a hospital that opened in 1905 to care for the poor was remodeled and reopened this summer with 139 apartment units, a rooftop deck and an indoor dog wash. Such conversions can pull at the heartstrings of communities. Residents often have an emotional attachment to hospitals where family members were born, cured or died. Nevertheless, the changeovers can also be welcome, particularly when hospitals have been long closed, their buildings left empty and dilapidated. Closing a hospital and converting it for another use is not exactly like renovating an old Howard Johnson's, said Jeff Goldsmith, a health industry consultant in Charlottesville, Virginia. "A hospital in a lot of places defines a community — that's why it's so hard to close them," he said. In Charlottesville, he noted, Martha Jefferson Hospital closed its downtown facility in 2009 to move closer to the interstate highway. An apartment building recently took its place. The trend of converting hospitals to condos and apartments comes as real estate values have soared in many U.S. cities, and demand for inpatient hospital care is on the decline. Surgery and other health services are being moved increasingly to freestanding outpatient centers, and the average number of days patients stay in the hospital has dropped significantly. Against this backdrop, the hospital industry is consolidating. Many institutions are shutting their doors. The number of hospitals in the U.S. has declined by 21% over the past four decades to 5,600 in 2014, according to the latest federal data. In addition, many older hospitals are too outmoded to be renovated for today's medical needs, which include large operating room suites and private rooms, said David Friend, chief transformation officer at the consulting firm BDO in Boston. Real estate investors say the location of many older hospitals — often in city centers near rail and bus lines — makes them attractive for redevelopment. The buildings, with their wide hallways and high ceilings, are often easy to remake as apartments. Some of the changes have elicited controversy, however — particularly in New York. St. Vincent's Hospital in New York, which traditionally cared for the poor and treated survivors of the Titanic's sinking in 1912, went bankrupt and closed seven years ago. Developer Rudin Management bought it for $260 million and transformed it into a high-end condo complex, which opened in 2014. 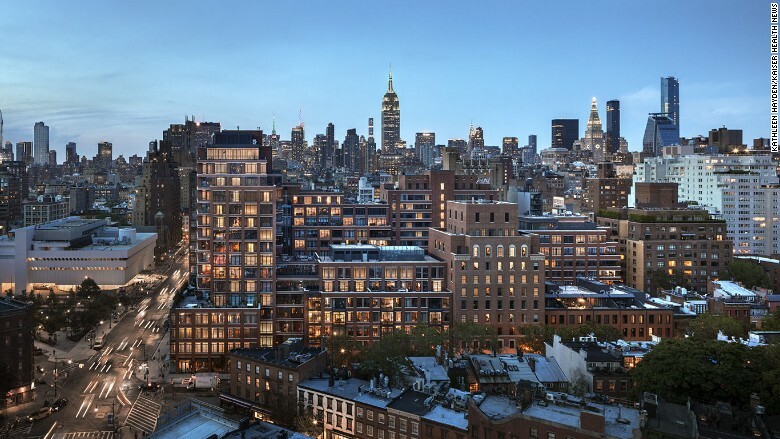 Earlier this year, former Starbucks CEO Howard Schultz reportedly bought one of the condos for $40 million. The shift from a place that cared for the poor to a home for the rich upset many residents in Greenwich Village. Jen van de Meer, an assistant professor at the Parsons School for Design in New York, who lives four blocks from the former St. Vincent's, said people in her neighborhood were sorry to see the hospital close for more than just sentimental reasons. "Now, if you are in cardiac arrest, the nearest hospital could be an hour drive in a taxi or 20 minutes in an ambulance across the city," van de Meer said. St. Vincent's is one of at least 10 former hospitals in New York City that have been turned into residential housing over the past 20 years. Friction often exists between developers and community, but sometimes the results are pleasing. The builders of 700 Constitution — the hospital-turned-apartment house a few blocks from the U.S. Capitol in Washington D.C. — preserved the old architecture of Specialty Hospital Capitol Hill, which pleased residents. "They did a beautiful job," said Nicky Cymrot, president of the Capitol Hill Community Foundation in Washington, D.C., a neighborhood group. Some former hospitals are used for purposes other than housing. In San Diego, Point Loma's Cabrillo Hospital closed in 2007 and was transformed into a language school nine years later, providing economic stimulus for nearby businesses. Linda Vista Community Hospital, which overlooks a park in Los Angeles' Boyle Heights neighborhood, opened in 1905 to serve railroad employees. Budget problems and declining patient rolls led to its closure 86 years later. The empty patient rooms, discarded medical equipment and aging corridors soon attracted film crews, who shot scenes for movies such as "Pearl Harbor" and "Outbreak." The hospital also attracted trespassers looking for ghosts and groups such as the Boyle Heights Paranormal Project, said Francis Kortekaas, assistant superintendent at Amcal Multi-Housing Inc., which bought the property in 2011 and redeveloped it. Amcal turned patient rooms into affordable senior apartments and renovated everything from the intensive care unit to the medical library. The company retained many of the building's original features, including mailboxes, dumbwaiters, windows and stainless-steel doors. "They really rescued a building with tremendous history ... while providing really needed low-income senior housing," said Linda Dishman, CEO of the Los Angeles Conservancy, a group dedicated to preserving and revitalizing historic structures. "It is such an iconic building in the neighborhood."